Send us your Telephone Number and we will contact you and explain about Owner Operator Services and all our trucking licensing and authority services. When you decide to go the owner operator route there will be alot of questions you will have. When of the top questions is about owner operator jobs. You have to understand that there are two major categories of jobs for truck drivers. In category one the truck driver owns (or leases) the truck and possibly the trailer and in category two the truck driver does not own (or lease) any truck or trailer. Owner operator trucking jobs are just as common as company driver jobs. 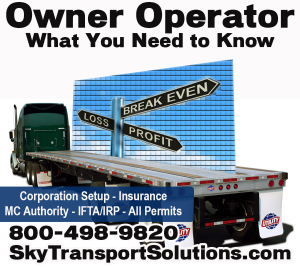 The owner owner operator pay is about 20% more than an employed company driver. This is after all expenses have been paid and the salary is taken by the owner operator driver. One misconception is that the OO makes twice as much as a company driver, this is not actually true. One intersting fact is that owner operator salary can be more enhanced by the fact that the person owns all of the equipment and can sell it. In other words the OO has assets that can be liquidated. The majority of OO haul truckload (TL) quantities and majority do not do less than truck load (LTL). To look for owner operator jobs in Texas or owner operator jobs in NJ it still true the he internet remains one of the most valuable resources for an owner operator trucking job search. Not only will the internet help you to find local truck driving or owner operator job, more importantly the over the road truck driver can find trucking jobs in throughout the country. Trucking jobs are available form West Coast California to East Coast Jersey City? You may find a local company hiring in your area. This way you can get a local route and be home at night. Understand that certain companies or routes are in higher demand than others companies or routes. So be open for any potential trucking company employers. Owner operator income is higher than company driver income. Note: owner operator dump truck jobs are not very common, there are very few jobs available. Dump trucks are local and are owned by a local trucking company that provides dump truck service. In summary the owner operator truck driver will make more money and have assets that can be sold as opposed to the company driver. Then there is the most important advantage to consider being an OO and that is future money making capability. When an owner operator does an owner operator agreement with drivers that they hire they are now making more money and growing. One option is to get a small loan to start your own trucking company. Keep in minf that most truck or tractor trailer are leased. This means you will not need all the money to buy a truck right away. Also in the begining you can factor your loads, so you are paid right away. Look at the following link: loans and grants for owner operator start up trucking companies. Wow, I didn’t realize that owner operator jobs paid that much more! I know if I was to be trucking, I would definitely go the route of being a owner operator. Thanks for the awesome info on owner operator trucking! Always glad to research whats going on in the trucking industry.